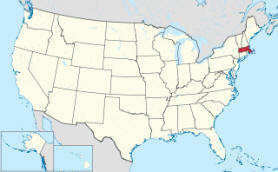 Where is the Capital of Massachusetts? 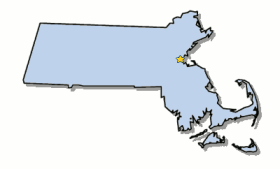 The Map of Massachusetts (MA) shows the location of the state capital in the "Bay State". counties, that has 14 counties, and the capital of the State is Boston. On a map, the capital city is always indicated by a star. Interesting fun facts about Boston including its history, location, county, current population, size of the city and the nickname of Boston, Massachusetts. The Massachusetts maps provide an outline of the state, which covers 10,555 square miles. The size of the state's capital city, Boston, is 89.63 square miles. Test your recognition skills of the map of the state, and knowledge of its capital, with our State Maps Quiz Game. The location of Boston is by Massachusetts Bay, an arm of the Atlantic Ocean. The city is located in Boston county, Massachusetts. Each of the 50 states have their own capital city. The city of Boston is the capital of the state of Massachusetts. The capital does not have to be the largest city in the state, but is usually centrally located either geographically or by population. Fact 4: History - The city was founded on November 17, 1630, by Puritan colonists from England. The majority of Boston's early citizens were Puritans. Fact 6: History - The Massachusetts town of Boston was pivotal in the events leading up to the American Revolutionary War (1775–1783). Fact 7: History - Patriots including John Adams and Paul Revere rebelled against taxation by the British. Fact 10: History - Several early battles of the American Revolutionary War occurred in or near the city, including the Battle of Lexington and Concord, the Battle of Bunker Hill, and the Siege of Boston in Massachusetts. The number of people, or the population of the capital city of Boston, Massachusetts obviously changes constantly but the government statistics for the 2012 population of Boston was 636,479, which provides a good indication of the number of inhabitants of the city. We hope that the interesting facts and information about Boston, Massachusetts will help kids and school children with their homework. Learn more by playing the States and Capitals Game.